Photo by Madeline Scarborough Gunmakers displayed their skills and conversed with one another at the Contemporary Gunmakers and Allied Artists show at the Campus Martius Museum on Saturday. Photo by Madeline Scarborough Lona Kuehn of Zanesville is learning how to tat from Sandra Kille of Salem at the Contemporary Gunmakers and Allied Artists show at the Campus Martius Museum on Saturday. 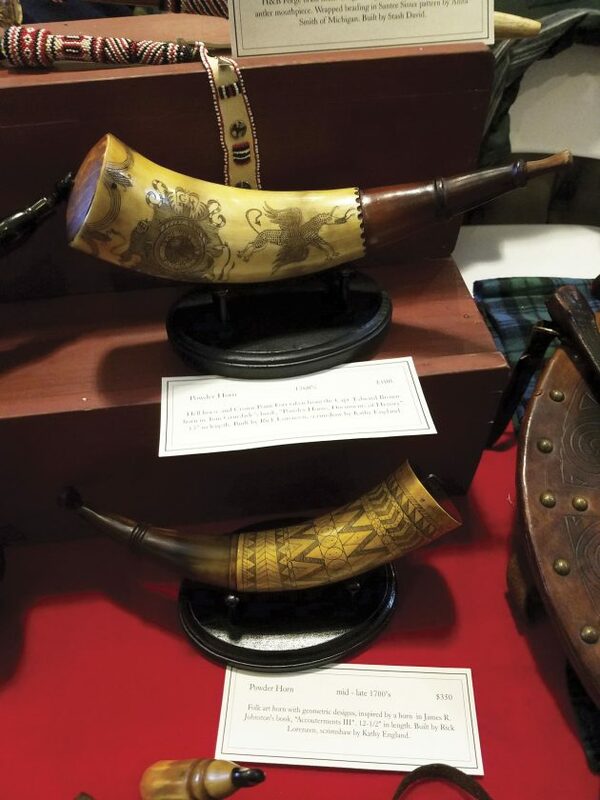 Photo by Madeline Scarborough Powder horns made by Rick Lorenzen and scrimshawed by Kathy England were sold at the Contemporary Gunmakers and Allied Artists show at the Campus Martius Museum on Saturday. MARIETTA — Settlers knew that the best quality items were always hand made. 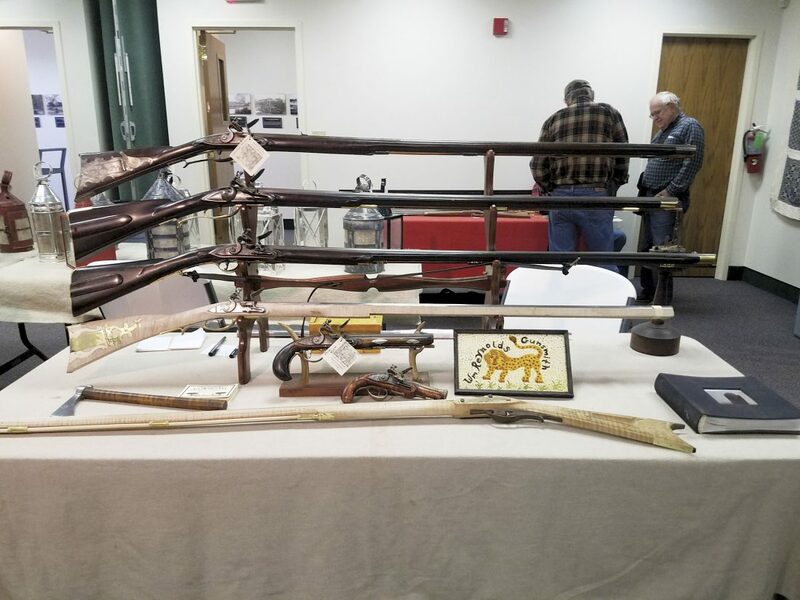 Gunmakers and allied artists from Ohio and West Virginia converged at the Campus Martius Museum for the sixth annual Contemporary Gunmakers and Allied Artists Show on Saturday. Visitors could see an array of handmade items including guns, knives, powder horns, leather bags and iron goods. “From the first arrival of the Ohio Company settlers to present day, this area has always been the forefront of quality,” said Bill Reynolds, museum historian. Reynolds said the show honors the original crafts of 200 years ago and the people who still carry on those traditions. 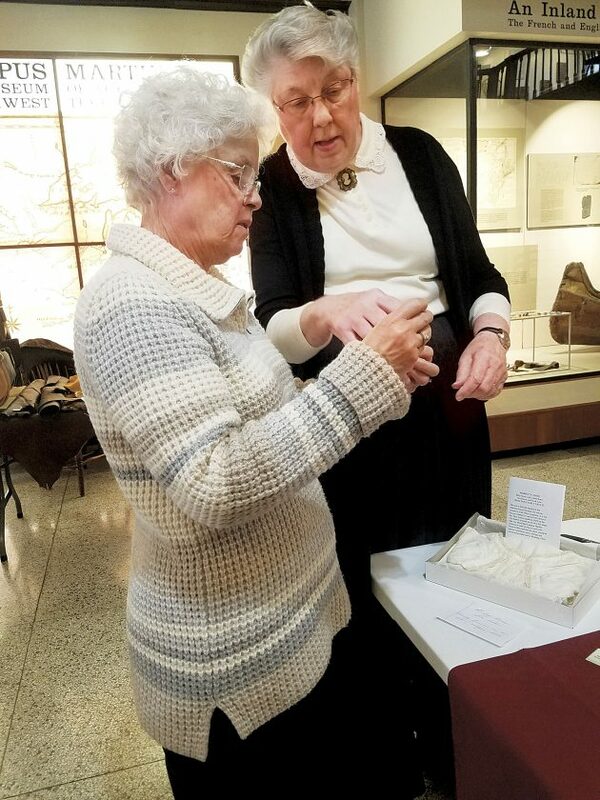 “The attendance shows there is a strong interest in the history of the artists and the early history of the Mid-Ohio Valley,” Reynolds said. For some, it’s their hobby to make guns and other items. It’s a career for others. Dan Raber of Millersburg, Ohio, helps run the Colonial Homestead. ” It is the world’s largest handtools store,” Raber said. The store has about everything, including tools for woodworking, leathercraft and gunsmithing. Sandra Kille of Salem was teaching tatting Saturday at the museum. Tatting is making lace by hand. “I have been tatting since 1990,” she said. Stash David of Cleveland brought many different replica items he has made or collected, including Scottish dirks, war clubs, powder horns and a pipe tomahawk. A dirk is like a dagger. “Scottish dirks were used in the Carolinas’ in 1775,” David said. “The war clubs were handmade replicas fashioned after ones from the 17 and 1800s,” he said. David said his favorite part is that he’s learned so much from collecting and creating artifacts. “It really gives you a new perspective on our history,” he said. The tomahawk pipe was made 35 years ago and was fashioned to resemble one used by the Eastern Sioux, David said. “The tomahawk pipe was very popular and imported by the thousands,” he said. Kim Thomas of Seville, Ohio, has been blacksmithing since 1984, but said he had wanted to do it since he was 8-years old. One of the pieces he made was a lock, including the locking mechanism and key. Blacksmithing also is a hobby for 16-year-old Meredith Yerian. “I started forging with my grandfather at 14,” she said. Yerian said her first was knife out of a railroad spike, which are now her specialty. She is branching out and enjoys learning the trade with her grandfather.